After a weeks-long competition, the winners of CHYE's Business Plan Contest competed live with the winner chosen by the judges. The Jewish Children’s Museum was abuzz Wednesday evening as the six finalists at the Crown Heights Young Entrepreneurs Business Plan Contest prepared to defend their startup ideas to a distinguished panel of six judges. “The evening was CHYE’s most sophisticated event to date, the culmination of the past 5 years,” Werde said. New York City Councilman of the 40th District, Matthew Eugene, applauded CHYE and the audience for their support. The prestigious and accomplished judges, Adam Eilenberg, Esq.,Jack Silberstein, CEO of Jack’s Gourmet, Zalman Stock of Spotlight Design, and Saul Friedman, founder of Saul N. Friedman & Co., asked candidates to explain their contingency plans, to detail their weak points, and clarify their business dreams. 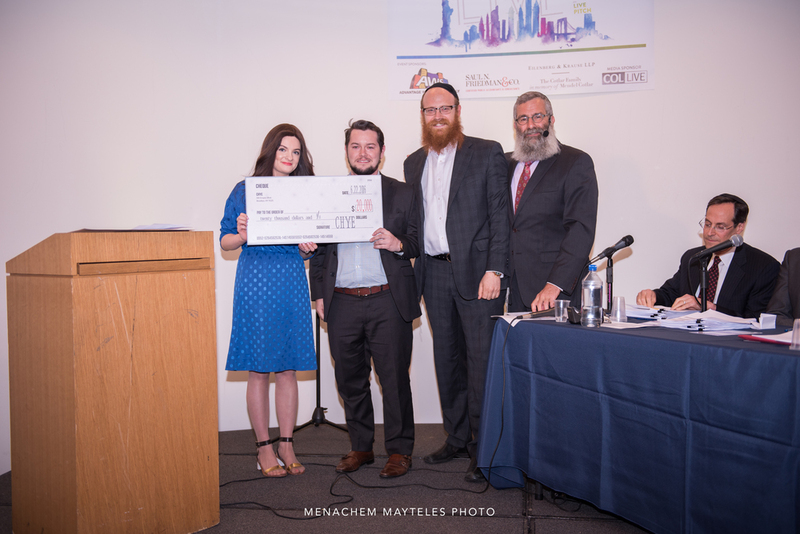 Malka Goldfein, of Babyroo, an online consignment store for gently used baby goods, is the Grand Prize Winner of CHYE’s Business Plan Contest. Along with a $7,500 cash prize, Babyroo will receive $12,500 in business services, which includes 1 year of free accounting from prestigious firm Saul N. Friedman & Co., and marketing and branding consulting with Spotlight Design and Ajax Union. First Runner Up Yetta and David Feldman of X:IT Performance wear, a designer and manufacturer of quality activewear for the modest, athletic women will receive $1250 in cash and $7500 in business services. Second Runner Up Nicole Marsella of Best Costume Outdoor Wear, a manufacturer of tznius swim dresses and modest water-friendly outdoor wear, will also take home $1250 and $7,500 in consulting. "CHYE has been a big boost for my tiny start-up, not just though this competition, but with the classes and consultations that they offer,” said Nicole. “The winners were all smart, strong Jewish women. I'm proud to belong to a community that supports women business owners in such a significant way,” said Marsella. While many in the audience came to support family and friends, everyone walked away informed and inspired. “It was pretty cool to see so many original ideas,” said Sarah Brummel, who was there for moral support for one of the finalists. “CHYE extends tremendous thanks to our generous sponsors for making this event possible: Saul N. Friedman & Co., Adam Eilenberg, The Smetana Family and AWS Supply, Daniel Cotlar in memory of his son, Mendel, to COLLIVE for being our media sponsor, to Spotlight design, Ajaxunion and Aaron Fehler of Evokia for their prize sponsorships, to Mendel Duchman who elevated the evening with his experience and passion and to all members of the CHYE founders circle” said Rabbi Werde.